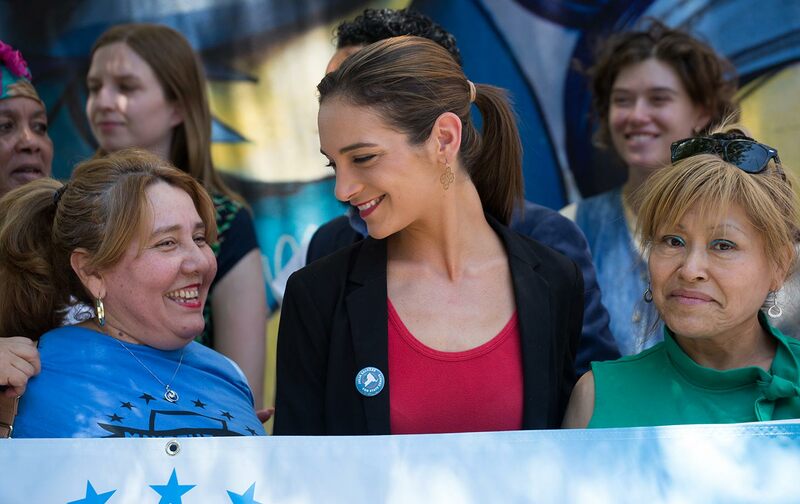 Can Alessandra Biaggi and Julia Salazar Unseat the GOP in Albany? Forget the mythical Bernie Bro: New York has a brigade of Red Rosas ready to take on the establishment. But politics—especially in Cuomo’s Albany—is never simple. For years, Cuomo enabled a group of rogue Democrats known as the Independent Democratic Conference (IDC) to bolster Republican control of the New York State Senate and hold progressive legislation passed by the State Assembly hostage. Stalled bills include motions to provide tuition assistance to the children of undocumented immigrants, enshrine Roe v. Wade in the state’s constitution, and protect LGBT New Yorkers from discrimination. The New York Times has characterized the IDC as “bizarre,” while the New Republic called it “one of the strangest legislative arrangements in American politics.” Liberal groups, meanwhile, have dubbed IDC members “Trump Democrats.” But New Yorkers finally have an appealing alternative in State Senate candidates Alessandra Biaggi, 32, and Julia Salazar, 27. Both have made opposing the IDC a theme of their campaigns. Biaggi is mounting a spirited challenge to Jeff Klein in State Senate District 34, which covers the Bronx, Pelham, and Mount Vernon. Klein, a prolific fundraiser who sports a golden Rolex and was recently accused by a former staffer of sexual misconduct, has been the IDC’s leader since its inception. Salazar’s opponent in North Brooklyn, Martin Malavé Dilan, was never an IDC member, which makes her case against him harder to parse. In fact, Dilan, who has represented District 18 for 16 years, has even called for IDC members to be ejected from the Democratic Party. Still, Susan Kang, an organizer with No IDC NY, an advocacy group dedicated to funding viable primary challengers to every IDC member, has called Dilan a “functional equivalent,” given that he “represents the same interests in Albany as the IDC.” In addition to significant donations from the real-estate industry, from which Klein has also taken thousands, Dilan accepted a $5,000 contribution from Klein himself in 2016. Complicating anti-IDC platforms further is the fact that the IDC was officially dissolved in April at a closed-door gathering in a Manhattan steakhouse. Cuomo helped broker the truce between the IDC and mainline Democrats, after claiming for years that he had no power to do so. According to No IDC NY, Klein kept the IDC’s bank account to fend off challengers and, potentially, to resurrect it. This has happened in the past. But a judge recently ruled the current account was illegal; the IDC has not yet dissolved it, and is unlikely to act until after the primaries. Craven Democrats who cut deals with Republicans to consolidate power while blocking a state’s—or the country’s—progress aren’t that uncommon. Remember when Senate minority leader Chuck Schumer trusted majority leader Mitch McConnell to address the status of Dreamers in exchange for ending a government shutdown? How about those Senate Democrats who joined Republicans to support legislation to roll back banking regulations? But amid the daily horrors of the Trump administration—and inspired by democratic-socialist newcomer Alexandria Ocasio-Cortez’s surprise victory over longtime incumbent Joe Crowley—this may be the year New Yorkers decide they’ve had enough. Voters aren’t just asking why a state as progressive as New York has repeatedly failed to pass popular legislation: the New York Health Act, for instance, which would establish single-payer health care in New York and which passed the Assembly in June. They are actively supporting younger, more progressive, and more diverse candidates to challenge Albany’s old guard in the primaries. Of the eight primary challengers endorsed by No IDC NY, none are white men, five are women, and three of the women are under the age of 40. Forget the mythical Bernie Bro; here comes a brigade of Red Rosas, led by Biaggi and Salazar. While it’s easy to focus on the similarities that unite these two candidates, the fact remains that they come from very different backgrounds. Early in her political career, Biaggi interned with Representative Joseph Crowley, the Queens party boss recently defeated in a primary by Ocasio-Cortez. (The New York Times ran a photo of Biaggi embracing Ocasio-Cortez in a story about Ocasio-Cortez’s victory over Crowley. In the caption, Biaggi is misidentified as Ocasio-Cortez’s “campaign manger [sic].”) Biaggi also worked as a lawyer in Andrew Cuomo’s administration. She joined Hillary Clinton’s presidential campaign in May 2015 and was promoted to deputy national-operations director in 2016. Her political roots, in other words, are firmly centrist. Biaggi has been endorsed by Our Revolution, The People for Bernie, The Jewish Vote, Stonewall Democrats of NYC, and the Working Families Party. “A lot of what we’re fighting for is in alignment with the Democratic Socialists of America (DSA),” she adds—even though her campaign is not currently seeking DSA’s endorsement. Salazar, on her part, has been a member of DSA for two years. She has their endorsement, along with those of fellow DSA-backed candidates Cynthia Nixon and Ocasio-Cortez, The Jewish Vote, Make the Road Action, and Congresswoman Nydia Velázquez. And she’s running on a platform very similar to that of Ocasio-Cortez: refusing corporate donations, pushing Medicare for All, housing justice, workers’ rights, criminal-justice reform, and the abolition of ICE. Then, when she was around 17, Salazar recounts a teacher exclaiming with alarm: “You’re going to become a Marxist!” upon learning she would be attending Columbia for college. What Biaggi and Salazar do share is a radical new approach to campaigning. Precisely by being transparent and vulnerable (which is rare in politics, and seen as particularly risky for women) they are transforming characteristics often perceived as liabilities—youth, gender, a relative lack of experience, and even shifting political identities—into strengths. Biaggi, too, knows how to connect with a crowd: She recently posted a charming clip of herself and a young female intern singing a duet from The Little Mermaid on Facebook to keep their spirits up after a grueling day. Instead of trying to downplay or conceal who they are and what they really think, these women are running as themselves. It’s a risk that paid off for Ocasio-Cortez, whose success has caused a sensation: In the week after Ocasio-Cortez’s victory, Salazar received more than $20,000 in individual donations. And it’s a risk that voters should reward. At last, candidates like Biaggi and Salazar are offering us a chance to make New York the progressive beacon it was always meant to be. An earlier version of this article inaccurately described Salazar’s citizenship status. In fact, she was born in the United States. The text has been corrected.